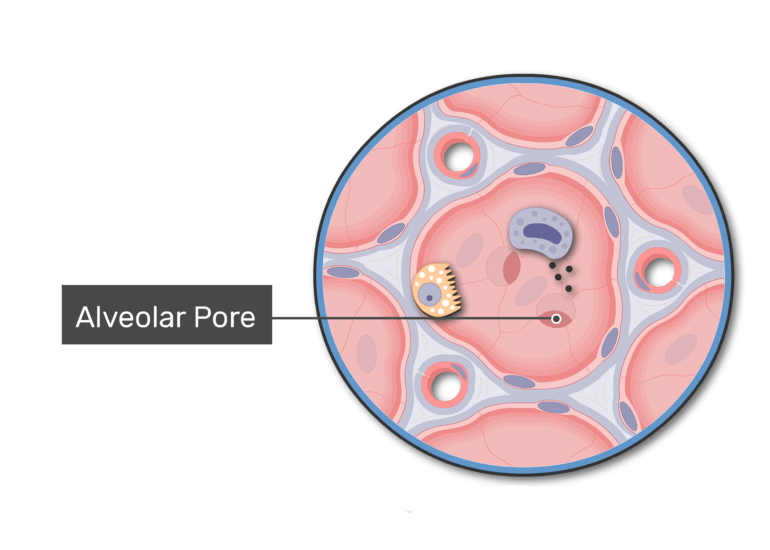 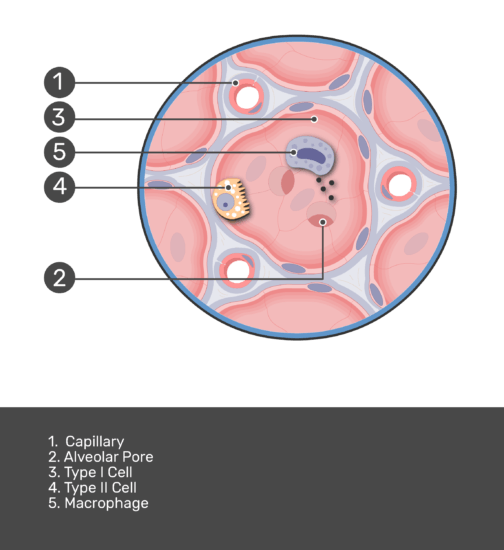 About 95% of the alveolar surface consists of simple squamous epithelial type I cells, and the remaining 5% is occupied by type II cells (or septal cells). 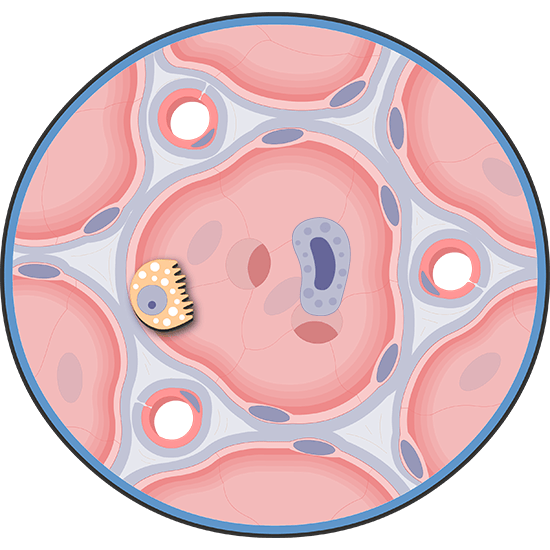 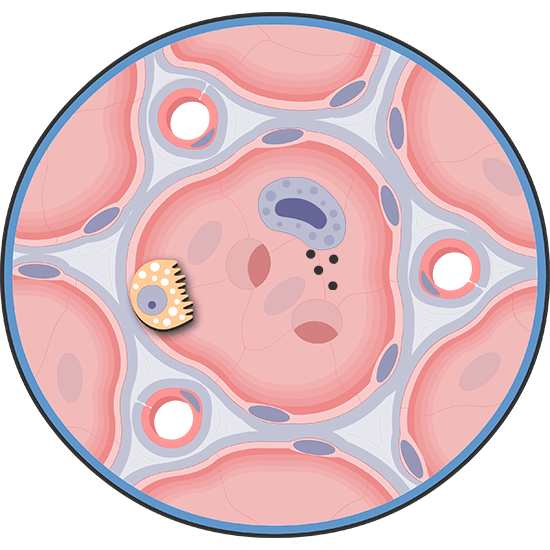 These large, rounded cells are located between the type I cells and secrete the pulmonary surfactant. 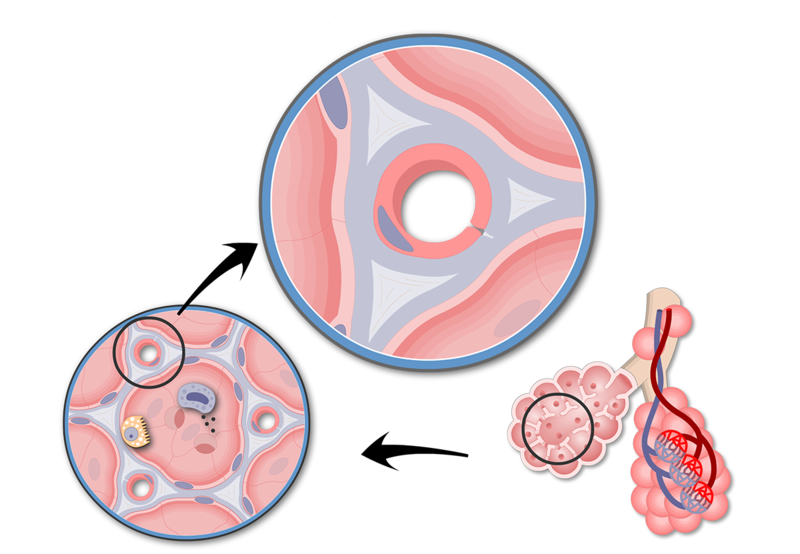 The complex of phospholipids and proteins in the surfactant reduces surface tension inside the alveoli, which keeps the alveolar walls from sticking together as they deflate during exhalation. Small openings called alveolar pores perforate the interalveolar wall and allow air to pass between alveoli. They provide alternative routes to and from the alveoli if an obstruction occurs. 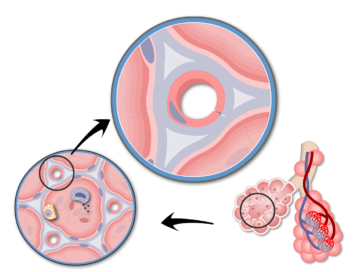 A network of capillaries and many supportive collagen and elastic fibers are found in the narrow interstitial spaces that separate the alveoli. 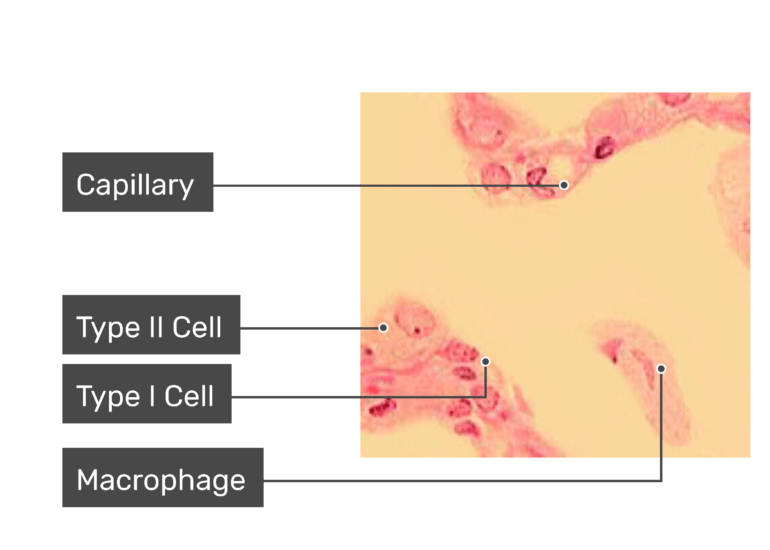 Macrophages (dust cells) move about the air spaces and between the alveoli, where they remove (engulf) inhaled particles, foreign invaders, and other types of harmful substances. Walls of connective tissue (or septa) partitioned the bronchopulmonary segments into many polygonal-shaped secondary pulmonary lobules. 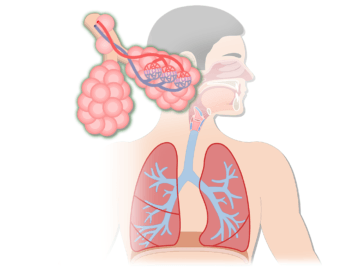 A secondary pulmonary lobule typically contains 3-5 terminal bronchioles. The respiratory is separated into the conducting zone and the respiratory zone. 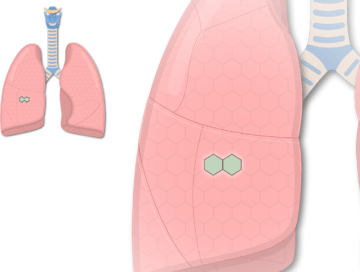 The conducting zone include structures that facilitate air to move in and out of the lungs. 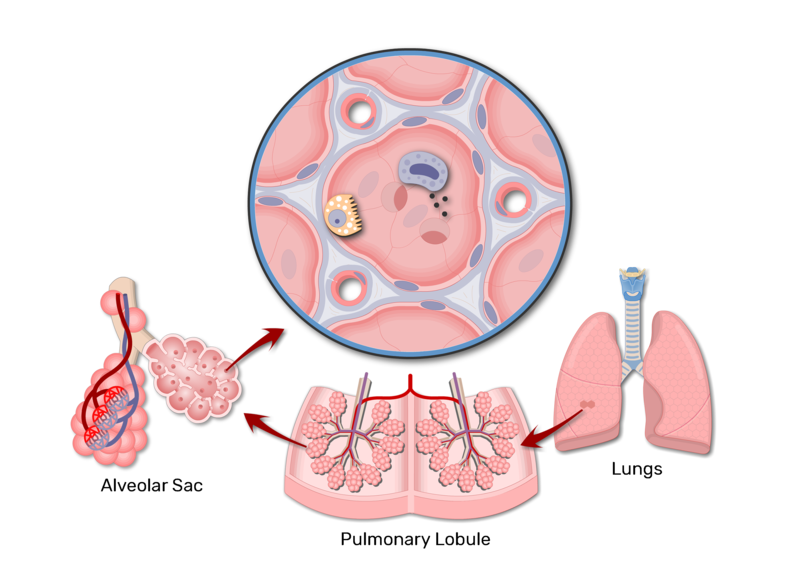 The respiratory zone allow inhaled oxygen to diffuse into the lung capillaries in exchange for carbon dioxide. 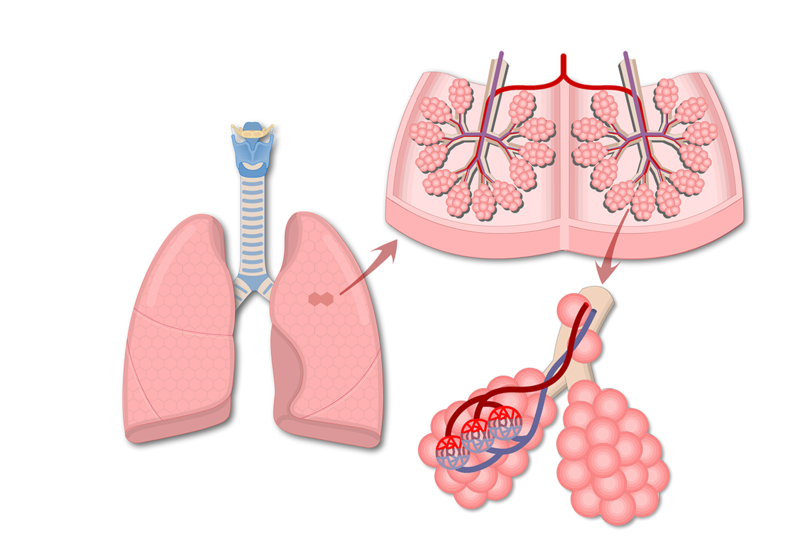 An interactive demonstration of the structure of the respiratory membrane and the mechanism of gas exchange occurring in the lungs.